We understand that organized sport is beyond the financial capacity of some families. We’re proud to offer a couple of solutions. Kyle Shewfelt Gymnastics has partnered with Kidsport to provide assistance to qualifying families. Kidsport and KSG believe that no kid should be left on the sidelines and all should be given the opportunity to experience the positive benefits of organized sports. If you are a family in need of financial assistance, please apply for Kidsport funding through the following link: Kid-Sport Calgary. Find out what Kyle’s Mom, Nola, has to say about gymnastics! Canadian Tire’s JumpStart also offers funding to qualifying families. All of our coaches are required to be Respect In Sport Certified to ensure our environment is as healthy and positive as possible. We highly recommend you, as parents, go through the online learning as well. Check out more information on the Respect in Sport Parent Program here. 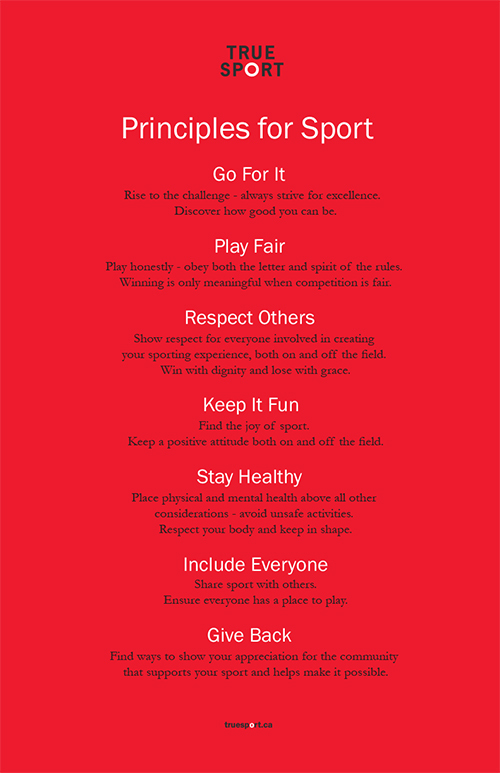 We are proud to be a True Sport space where the following principles guide everything we do. Join the True Sport movement here. Check out more information here: Canadian Tire Jumpstart.